While we were all playing Candy Crush and watching Duck Dynasty, a creative Russian man named Ilia Shvetsov created an unbelievably accurate model of downtown Shreveport out of paper and cardboard. 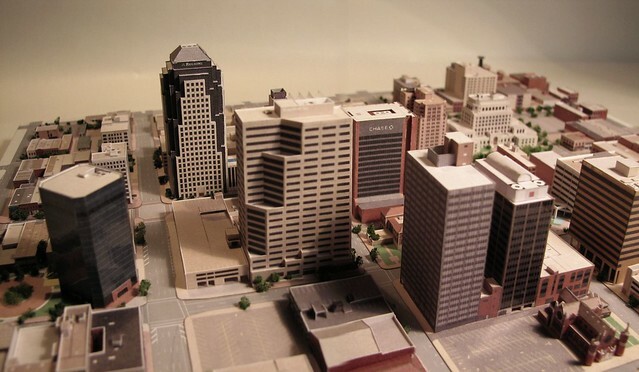 The model, shown above, meticulously recreates virtually every aspect of downtown Shreveport, including parking spaces, the bus terminal, and even the unique architecture of Holy Trinity Catholic Church. From what we observe, every window pane and label on the buildings is accounted for in the 315 square-millimeter model. It took Shvetsov, of Priladojsky, Russia, 44 days to create the model. Each day, he worked painstakingly for 8 hours cutting, pasting, and painting the cardboard and paper until his work was complete. He has also created models of Oklahoma City and Tulsa, but for obvious reasons our favorite is that of Shreveport. The model can be viewed in all of its wondrous detail at Shvetsov’s Flickr page. It’s definitely worth your attention. Mr. Shvetsov, if you have never been to Shreveport, we cordially invite you to visit the city you wonderfully recreated. Thank you, sir!